Looking for day trips from Athens that are easily accomplished with kids? 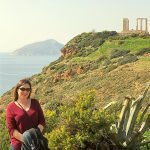 Check out the Temple of Poseidon in Sounion, Greece. 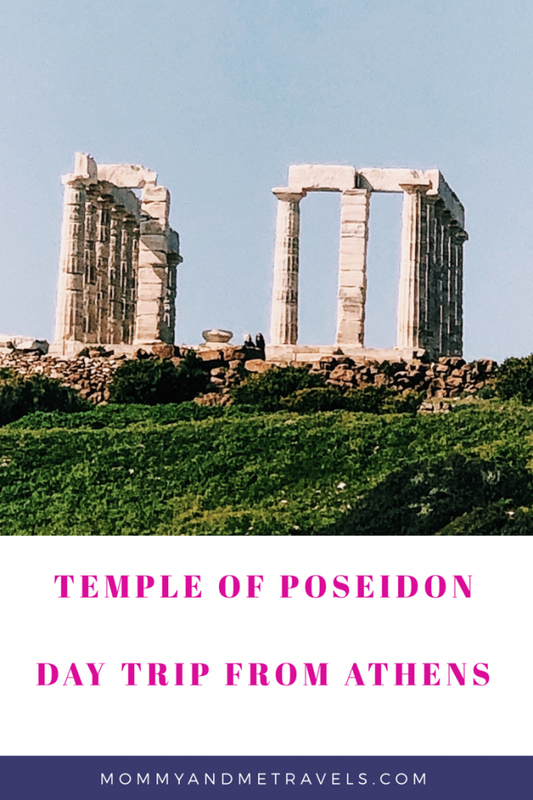 Mommy And Me Travels is sharing what you need to know to visit the Temple of Poseidon in Sounion on a day trip from Athens. A visit to Greece isn’t complete unless you visit at least some of the Greek god and goddesses ruins. Have only one day or half a day? This post is dedicated to providing tips and tricks on what you need to know for exploring the Temple of Poseidon. Mommy And Me Travels spent a week on a guided tour with Gate1 Travel around Greece. This tour was not a sponsored trip. More about our Gate1 Travel experience can be found on our online review (coming soon). (Quick note: We had a great tour guide, Vivian, who showed us a wonderful time and was able to explain everything that was on our itinerary.) You may ask, how did you get to see the Poseidon Temple as this is not part of the guided tour? The last day of the trip is an open day so you are able to visit this temple easily from Athens via public transportation on your own. Poseidon is well known as the Greek God of the Sea, but he was also the God of Earthquakes, Storms, and Horses. With his brothers, Zeus and Hades, they were known as the “Big 3 Gods”. Myth has it that Poseidon was the worse tempered of all the big 3. This is depicted in a story about him forcibly having a sexual encounter with Medusa on the steps of a Temple to Athena. He is said to have performed this egregious act due to him being vengeful when insulted. The insult was that in Athens, Poseidon was seen as second to Athena. Fun facts – The name Poseidon in Greek means husband. He wielded the trident (3 pronged spear). He assisted the Greeks in the Trojan War. He and Medusa conceived Pegasus (flying horse). To win the favor of the people of Athens he made it spring at the Acropolis, however he still lost to Athena with the olive tree. Poseidon’s Temple is located in Sounion, Greece (sometimes referred to as Sounio). Sounion is situated about 43 miles south of Athens on the southernmost tip of the Attica Peninsula. There are many pay tour buses/coaches that will take you to visit the temple. Most of these trips will cost you about 50 euros a person (prices in Feb 19). Mommy And Me Travels opted to save our euro and complete the trip via public transportation. The cost of a bus ride from Athens to Sounion on public transportation is 12,50 euro a person round trip or 7 euro each way if traveling down and back on different days (prices in Feb 19). That means 4 people can take the public bus to Sounion for the cost of 1 person on a guided tour. If like me, you probably have a lot of questions about taking public transportation. Where do I go to get the bus? How easily will I find the temple? How long does it take? Is it safe? What other things should I know that I haven’t thought about? 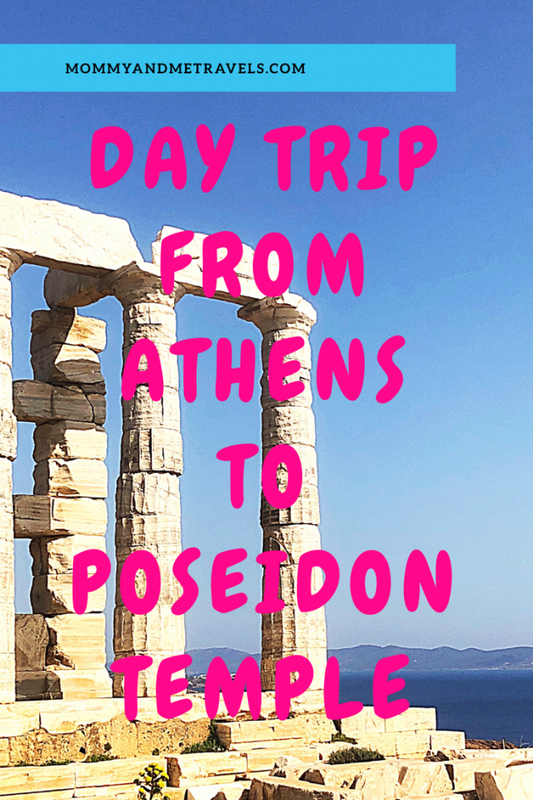 Don’t worry, Mommy And Me Travels has completed this guide to help you start your day trip journey to Poseidon’s Temple via public bus. Where do you go to get the bus? There are a couple of different options for this answer. You can take the metro to the main bus stop in Athens and get on the bus heading to Sounion from there. Or, and my recommendation, you can walk from your hotel to the nearest street bus stop and watch for the Sounion bus there. I will tell you that when I asked the hotel how to get on the Sounion bus, the hotel front desk individual sent us via the metro to the center of town to the main bus stop. This route added an hour to our trip. We quickly discovered the latter of the above options when we passed by our hotel on our trip to Sounion. Needless to say, on the return we got off the bus right next to our hotel. No need to take the added hour metro time when it isn’t required. The trip each direction will take about 90 minutes. 1) Heading to Sounion, try to get seats on the right side of the bus. The views of the water are breathtaking as you depart from Athens. 2) If you catch the 0805 bus then you can easily complete this day trip in half a day leaving the afternoon available for additional site seeing in Athens. 3) Don’t search around for how to buy bus tickets. You just get on the bus and eventually an attendant will board at a random stop and then you will pay. The cost of the trip is the same regardless of where you load or unload. How to do you locate the Temple? Tip: You cannot reach the water from this bus stop. You are able to walk down the hill and find a public access area or you can get back on the bus after you venture around the Temple and get off at a beach stop as you head back to Athens (this is what I recommend). Your paid ticket is good all day and/or until you get back to Athens. Is the public bus safe? Absolutely! Just be smart! Greece boast as being 98-99% crime free. The largest crime issue is pick pocketing. This means, don’t let anyone get close enough to touch you. Keep your valuables in the hotel safe. Don’t flash your money around. We never once felt unsafe on the bus. Some tour guides will advise you against taking the public bus. Of course they don’t want you on the public bus, it is cheaper and you won’t be spending your euro with them or their “recommended” restaurants and shopping areas. Tip: Everyone speaks English. You will quickly realize that you are in a safe environment. Keep an eye on your belongings and don’t sit anything of value down on the floor or in the seat next to you. Poseidon’s Temple is a must visit. Why? Well it is one of the best preserved major monuments of the Gold Age and is surrounded by the most amazing views of the Aegean Sea. 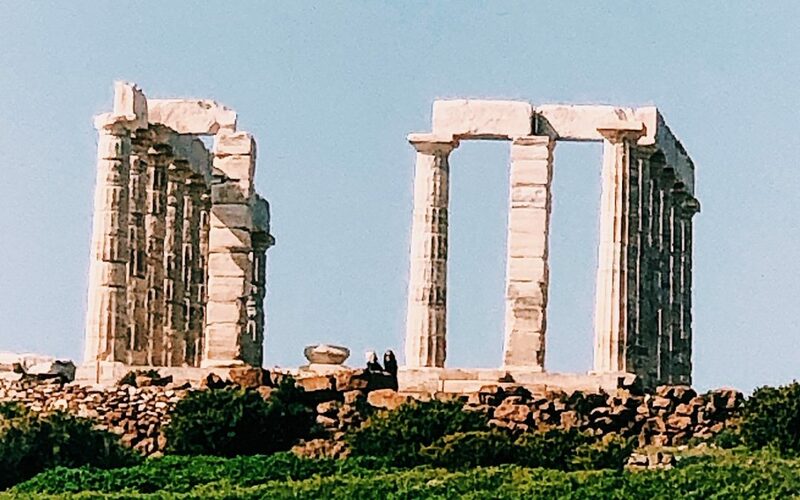 This temple’s location was important to sailors and warriors returning home because when they saw the crisp white columns they knew they were almost home to Athens. There are many signs (in both Greek and English) that allow you to tour this temple on your own. No need to pay for a tour guide. I quoted only a very small portion here for you. There is so much info and knowledge that you can read about and explore. Take your time and enjoy your day at the temple. Fun Fact: The columns on the long side of the temples in Greece all have 2 times the short side plus one ((2 x Y) +1 = Long side columns; when short side equals Y). Answer = Poseidon’s Temple has 6 on the short side and 13 on the long side. To access the temple and grounds you will need to pay a small entry fee of 4 euro (cost Feb 19). This allows you to come and go as you please so feel free to wonder around and even take a break at the café while enjoying your family day. Now for what you need to know for traveling to the Temple of Poseidon with your kids. 1) This temple is easily accessible with a stroller as the path is clearly marked and mostly paved. If you can forgo the stroller though, I would recommend using a baby carrier instead. (We love our brighter elements baby and toddler carrier.) Why you might ask, because while you can see the temple easily with your stroller it will be more difficult to climb up the hill/rock where you can get the most amazing picture views of the temple. Also, there are many walking paths that are only accessible via stairs and, as we all know, strollers are not always stairway friendly. 2) You are welcome to travel with snacks and drinks for you and the kiddos but it is not necessary. There is a café on sight that you can sit and enjoy a drink, glass of wine, beer, or have a snack or lunch while enjoying a spectacular view of the temple and sea. I always prefer to travel light on day trips so the less I can carry the better. We had lunch at the café and it was very yummy. Hint: The gyro was enough for me and my kids to split. It was huge! 3) Watch your young kids! In reality watch all your kids and yourself. When wondering around the walking paths to see the spectacularviews, there are few rails to keep you from falling into the water or rolling down a hill. If you stay on the paths then you have little to worry about. The issue is keeping kids from roaming off of the paths and towards the cliffs as there is nothing to require them to not climb on the rocks or try to look over the side. Mommy And Me Travels hopes that this helps you to decide on visiting the Temple of Poseidon. 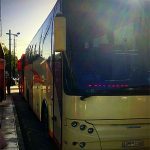 We recommend using the public bus for the day trip from Athens as it is easily accomplished and definitely budget friendly. Looking for more ideas, check out our guide here for Planning Day Trips. Wanting a unique day trip idea via ferry? Check out this post about the Greek Island Hydra by Gallop Around The Globe. Continue the journey with us on Facebook, Instagram, Twitter, and Pinterest. We’re headed to Greece in 2020 so thanks loads for this recommendation. Looks like the perfect place to explore! That’s awesome! we nearly never visit historical places with the kids because most places are not children-friendly! I love that you put this day trip in perspective with kids! 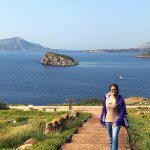 So many people fail to include tips for traveling with children- especially in Greece! Our family’s going next year! Visiting Greece is on my bucket list and reading this post, makes me want to go now. Last year, my alumni had a trip to Greece, I was not ready, I will not miss the next occasion.